Parkes Castle in County Leitrim is one of the best places to see in Ireland, certainly a must for anyone who loves castles. 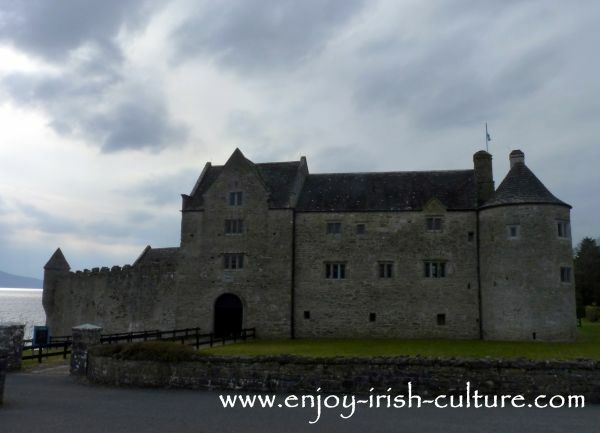 Parke's Castle is in our top five attractions in and around Sligo town, a definite thumbs up for a visit that will be enjoyable for the whole family. 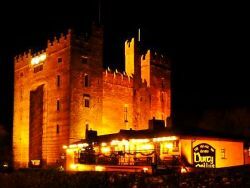 The castle is one of the most beautiful medieval castles of Ireland. It is in the care of the Office of Public works (OPW) who offer an excellent tour. The castle was lovingly restored under their care using traditional materials and craftsmanship. The setting is stunning as well, the castle is located right on the lake shore. 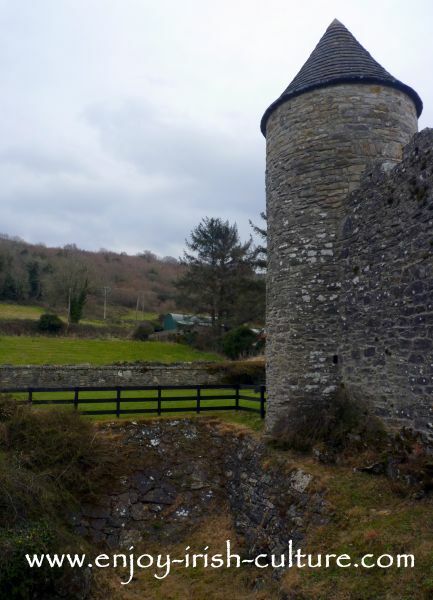 This Irish castle is located a 25 minute drive from Sligo town, a trip well worth it for the beautiful views alone which are to be had along the route on the shore of Lough Gill. From Sligo town head for Dromahair on the R286. Go right through the village and keep going straight, the castle is located directly on this road. The castle is open to the public from the end of March until mid September every day from 10 a.m. until 6 p.m. Plan an hour for the visit. Phone them if you need to clarify whether they are open the day you plan to visit: +353-71-9164149. There is a large car park, and the castle has public toilets with disability access. The castle itself has disability access on the ground floor only. During the summer months there is a tea room. There is a 45 minute tour of Parke's Castle all for the price of 3 Euros per adult, and 1 Euro per child. We would highly recommend taking the tour. It’s really worth it not only for an understanding of the castle’s history and features, but also for a history of the area. The guides are knowledgeable and very kind to any children taking part in the tour which is a nice bonus for parents bringing enthusiastic, noisy five year olds like we did. 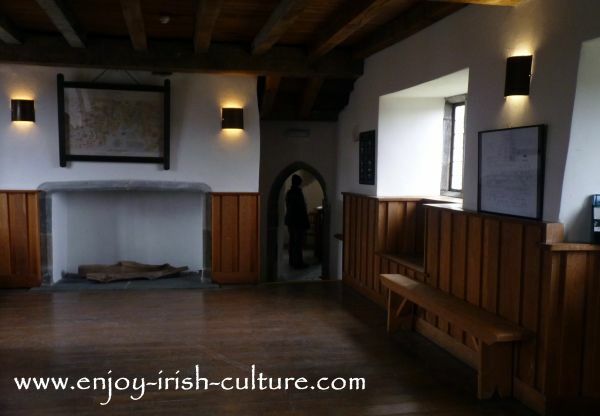 The tour brings you through the entire castle and explains the different rooms and their useage. The medieval castle life style was so very different to how we live today that a lot of it actually needs an explanation as you would miss it if you were just walking through. 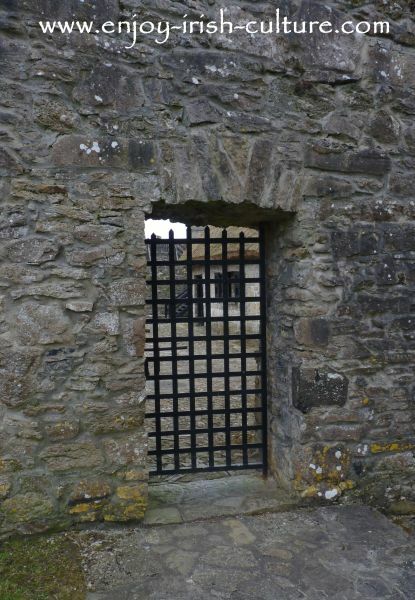 The first fortified structure on this site was owned by Sir Brian O’Rourke. At his castle he sheltered at least one survivor of a Spanish Armada shipwreck at a time when Spain and England were on the brink of war. As a result Brian O’Rourke became a wanted man and was eventually captured to be executed in London in 1591 for high treason. His lands were confiscated and sold to the English Captain Parke. Parke built a larger fortified mansion here, the castle that can be seen today. It is sometimes called a ‘plantation castle’ because the lands now were an English plantation. He built the castle for himself and his family probably using the stones from the demolished O’Rourke’s Castle the foundations of which can be seen in the courtyard. As he owned more than one castle however, he wasn’t living here full time. To conclude, one of the best castles in Ireland, fascinating piece of history, great tour, great opportunities for exploration with or without kids- if you are in the area at all this visit is a must! On your way back to Sligo, stop at Dromahair village and take the beautiful ten minute walk by the riverside to Creevylea Friary. 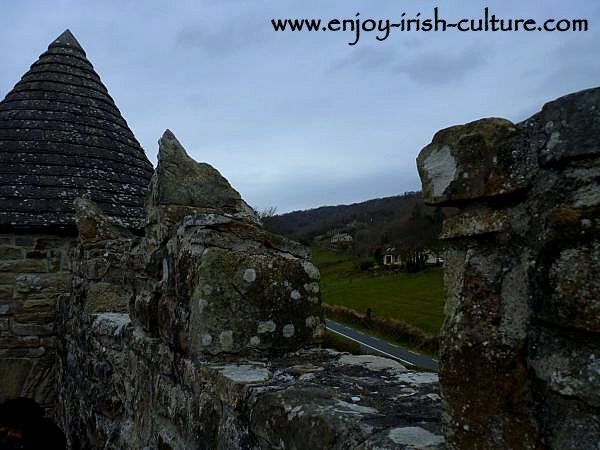 If you have more time to spare, visit Cashelore Stone Fort after that, it is located just a mile or so off the road back to Sligo. On a beautiful day, take a boat tour on the Rose of Innisfree from the pier right by the castle around Lough Gill and the lake isle of Innisfree, a place immortalised by Yeats in his poetry. The boat offers a full bar service and home baking and there are poetry recitals. If you are in the area for a couple of days, include a visit to beautiful Streedagh beach in your itinerary and visualise the scene of the Armada ships sinking here followed by the ensuing slaughtering and looting. before you head off, find out more about Parke's Castle here, its history and features so that you'll know what to look out for. Hello there, hope you got a lot out of this article on Parkes Castle. If you like what we do on this website, please support us with a social shout out letting all your friends know we exist. You can use the handy social buttons both at the top left and at the bottom. Thank you so much! Warmest regards from Ireland from Susanna and Colm.